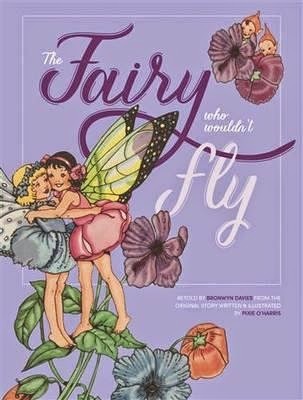 Bronwyn Davies retells the original story by Pixie O’Harris of The Fairy Who Wouldn’t Fly, one of the classics from the National Library’s Marcie Muir Collection of Children’s Books. Themes covered include being different, conquering your fears, discovering your own individual gifts, adjusting to other’s expectation while staying true to yourself, and working together to bring about change. It sounds a lot, but the story is so perfectly arranged that one theme rolls into another naturally. The Fairy-who-wouldn’t-fly doesn’t want to be like other fairies. She enjoys lying in her spider web hammock and watching the world go by. So she is banished from Fairyland to the Woodn’t until she learns to comply with the rules. In the Woodn’t everything is different. Lots of living things don’t do what is expected of them. Trees grow their own way. Kookaburra doesn’t laugh. Frog doesn’t like hopping. Bee won’t join the hive. Bat refuses to fly at night, Glow-worm won’t shine, Spider won’t spin, and Flower’s petals won’t close at sunset. How boring it all is. The Fairy-who-wouldn’t-fly begins to imagine how it would feel to fly. At first, her attempts fail, but with perseverance, she discovers joy and achievement in flight. When a very young boy is lost in the forest, the fairy enlists the help of the group to return the boy home. In a show of unity, they all reclaim their abandoned talents and learn many things about themselves they didn’t know. The exquisite original illustrations are accompanied by additional pictures from NLA’s collection. Davies has breathed new life into an old favourite for another generation to enjoy and learn from. The presentation, as usual, is of the highest quality. The book comes with a gorgeous jacket and the valuable information is found in the List of Illustrations. This is another gem for collectors and lovers of unique children’s books, regardless of age.